A woman drives on a country road, stops in a paddock where two mules graze. She shoots one with a rifle and drives off. We are never to discover the exact meaning behind this and will never meet the woman again but by the end of this film we have a pretty good idea of what has happened in this prologue. After the credits we meet David (Colin Farrell) who is fronting up at his society's regulation partner-finding process. He is to stay in a hotel for forty-five days, mingle with the guests and, find a new life partner. It's not just illegal to be single it's socially intolerable. If he fails within the time he will be turned into the animal of his choice. The dog he brings with him used to be his brother. He chooses, if a failure, to become a lobster. He gives very practical reasons for the choice and is praised. The life at the hotel begins with a mass breakfast each day (sometimes with an imposed handicap) and continues through the day with hunting parties in the local woods to cull the loners, those who have exited the society and its coupling rule, with the kind of dart rifles that large animal vets use. There are also dances, induction ceremonies, public torture for masturbators (a forbidden solo pursuit), strange virility-testing contacts with the staff in the rooms and rewards for every coupling that happens. At this point The Lobster resembles the kind of brutal social satire more commonly found in the cinema of the 60s and the 70s. The kind of films like Valerie and her Week of Wonders, The Holy Mountain, Salo or Immoral Tales that asked violent questions about the way we live and mixed irresistable comedy with gut-wrenching imagery. I caught up with these decades after their release so any nostalgia I feel about them is a delayed one. 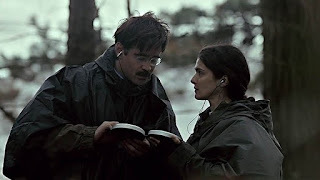 Nevertheless, watching The Lobster felt comfortable for its resemblance to those films and discomfiting for the dread just below the surface which pulses constantly. As we watch the richly crafted dystopia and laugh along with it (there are many dizzily absurdist moments) we suspect there is more to come and that it will probably be less pleasing. The loners who are hunted by the hotel guests have their own society, eking out a bandit life in the woods. But here, where David flees (after a funny and difficult failure to couple) is the counter regime. The loners are paradoxically collectivist but anti-copular. Their punishments for affection between members are horrific. As cold and severe as the mainstream's regulated partnering is the savagery of the alternative leaves so little room for warmth or hope that the option of surgical metamorphosis back in straightsville (not shown but described repellently) seems a viable one. When David falls in love with the Short Sighted Woman (a committed performance from Rachel Weisz) we know their problems are going to dominate the film. A frequent criticism of this film states that the first act in the hotel with its instant satire and black comedy is dwarfed by the slower and heavier remainder but I disagree. The life among the loners chapters do feel disproportionately long and can drag and, yes, the pace and laughs of the first part are missed. However, for me this section is the film's core; we have seen the workings of conformity distilled into a harsh concentrate in which single shaming has become terminal and we need to then really examine the alternative and if it is less funny then we might want to think about why. Do we force people into couplings or prevent them from intimacy? Do we develop struggling countries or promote population culls toward a more sustainable future? Do we have warfare or leave ourselves open to takeover? These are extremes and there are always more pragmatic compromises in the gaps they leave but these are always harder work. For me this film suggests the slog and the sacrifice might not just be the better, more humane way but forced upon us if we aren't prepared for it. The luxuriant look of this film, whether in the deep polished wood of the hotel's interiors or the enlivening dewy woods of the world outside and it is created through hard slog as most of it was done with available lighting. Always good to hear the mighty Shostakovich used in a score, undercutting the ersatz joy of the world of the hotel and highlighting its severity. The cast has been picked with an obsessive precision. If we recognise alumni from Dogtooth or Blue is the Warmest Colour we can rest easy knowing they are here for more than the cachet of the cool films they've been in; Angeliki Papoulia's Heartless Woman is terrifying as is Lea Seydoux's Loner Leader: we're not just seeing the pretty faces and feeling cool because we recognise them. Rachel Weisz goes from passionate, to desperate to eerily urbane without a seam visible. Ben Wishaw, Olivia Coleman and John C. Reilly work hard at small roles. And Colin Farrell, especially welcome speaking in his native Dublin, anchors everything with a palpable depression that he makes both pitiable and appealing. This film is made of very good things. Writer/director Yorgos Lanthimos had already wowed me with 2010's Dogtooth, a film so obstinately its own that its viewers were forced to accept its terms or use the door. Because of it and others like Attenberg terms like the new Greek weirdcore were coined to cope. But they don't help, especially when a phrase like imaginative fiction serves perfectly well. This film is made of fears rendered recognisable through great craft. It stands as resolutely outside the mainstream as its loners in the woods but the difference is that it knows better and knows we know.